Do you enjoy historical events? Are you a history buff? Does the thought of learning something new put a smile on your face? Do you like researching our presidents to see their similarities? Are you doing research to possibly get into politics? 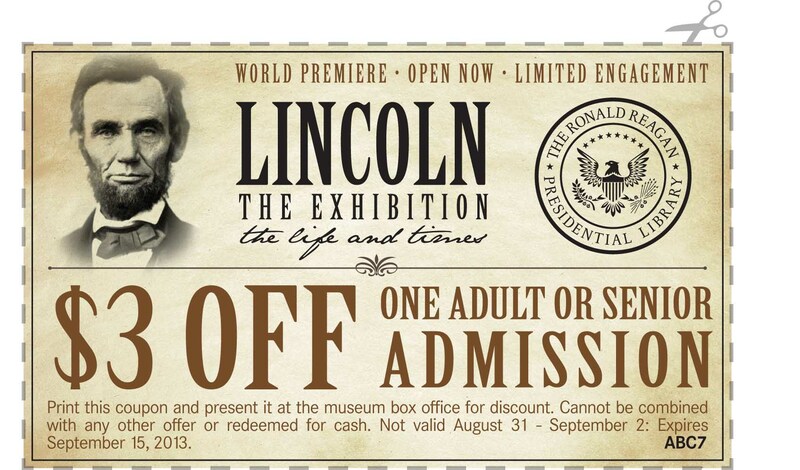 At any rate, you can go see the new Lincoln exhibit with this DISCOUNT ADMISSION COUPON. 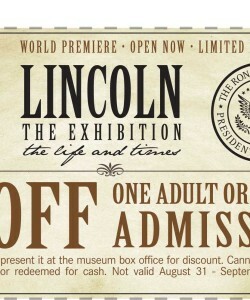 You can take advantage of seeing first-hand, up close and personal about the life and times of Abraham Lincoln. This is a world premiere, and also a limited engagement so you want to make sure to put it on your calendar so you won’t miss it. As one of our historical figures, there is much to know about Lincoln. As of late, there are many movies being made and books being written about his life and of his views. 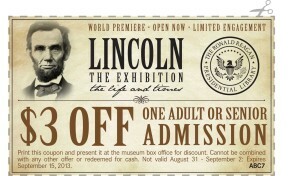 This coupon is good for one adult or senior admission. This exhibition is being presented from The Ronald Reagan Presidential Library. Historical facts and figures are always something to be pondered and this is no different. Maybe you are a teacher who would like to teach a lesson on Lincoln. This would be perfect for you. You’ll have a great resource in which to base your lesson plan. Lincoln the man was very intriguing. Take the time to get to know this president and understand why everyone holds him in such high regard. Grab your friends or even your parents and take a trip down to the museum to check out the exhibit. This one is special and may only come once in your lifetime.